Some of the new presets do this thing where the little rectangles beneath the Layer letters (A, B, C and D) are lit up (normal) but with a new color I've not seen before (not normal). The behavior seems to be they are tied / locked together, at least on the FX page, where if I click one Layer letter, all layers get selected at once. Something different / new is going on here, but I can't figure out what it is or what it means. I am running Cubase 9.5 on Sierra and Nuendo 8.2 on Windows 10 and haven't seen that. I can try cubase 9 on mac and see. Thanks for the offer, but I'm on Windows 10, so I'm not sure that testing on a Mac would help. I have some older versions of Cubase installed too, so I'll try some of those. I suspect it is probably just my PC, but the standalone seems fine and I'm sure the beta was okay in Cubase. It’s the new shared signal path - it’s selectable in a drop down on the main tab. noiseboyuk wrote: It’s the new shared signal path - it’s selectable in a drop down on the main tab. Ah, neat. Can you be more specific though about where I find this drop down? I tried clicking around various places but am not finding an option for it, I must be missing something obvious....? thanks! Just loaded Cubase 8.5 and it runs perfectly in there - patches load and the GUI updates almost immediately. Maybe I have a duff preference in Cubase that is causing the problem, unless anyone else sees the same issue in version 9.0.40. So I've trashed my Cubase 9 settings, which should default all preferences, and rescanned everything. I'm still seeing the same GUI issue - the sound loads and is playable immediately but it takes around 10+ seconds for the GUI to update to show the patch name and parameters. Fine in Cubase 8.5 on the same machine and in the standalone application. At the weekend I might install Cubase on my laptop and see if I get the same problem there, to rule out my hardware configuration. iPlogger wrote: All of this is done through CC and NRPN messages coming directly out of the keyboard, so it IS possible to use MIDI controllers/software to simulate the same exact message and mimic the hardware messages. Is there a way to easily see what those CC / NRPN messages are so we can start mapping our generic controllers? Because as cool as the hardware integration is (and it’s very cool! ), I’m not planning to drop that kinda cash when I have perfectly capable MIDI controllers here. They're kind of right though. It would take more than just a simple MIDI Learn setup to recreate what they're doing. Maybe something more complex like Bome Translator + some scirpting could get you there, but basic MIDI learning wouldn't. Simple example: I have a System-8. Oscillators 1 and 2 can be routed to a number of preset destinations (Manual, LFO, Filter Env, Amp Env, Pitch Env). Those configurations remain in sync when you turn that knob. So Omnisphere is doing some custom routing behind the scenes based on the current knob value. Now, to go a step further, if I turn on Hard Sync, osc 2's pitch is sync'd behind the scenes to the Pitch Envelope, while osc 1 remains freely configurable. This would be hard stuff to do via MIDI learn alone. You need to do some custom MIDI programming to do the assignments behind the scenes, unless your software synth just happens to have a 1:1 layout to your hardware synth. Could you recreate the System-8 layout in a software controller and connect that Omni? Yeah. I think a few have done that already. You technically don't need the hardware. But could you do what Omni with another softsynth just via basic MIDI Learn? No. Not unless that softsynth had the same routing and layout as your hardware synth. They're kind of right though. It would take more than just a simple MIDI Learn setup to recreate what they're doing. Maybe something more complex like Bome Translator + some scirpting could get you there, but basic MIDI learning wouldn't. But could you do what Omni with another softsynth just via basic MIDI Learn? No. I get what you're saying, and from that standpoint I can buy their "more than just MIDI learn statement" better. So, Spectrasonics has done the scripting that differentiates Omnisphere's response to MIDI messages from typical soft synths. But, when you turn a knob or press a button on your System-8, nothing magical happens. It sends a CC / NRPN message over a MIDI cable (right?). If I program a knob on my MIDI controller to send the same value, then Omnisphere should respond the same way. I totally get where they're coming from about MIDI controllers being generic and not mapped out like a highly usable synth. That said, it's all knobs, sliders, switches, and buttons sending digital data. padillac wrote: I get what you're saying, and from that standpoint I can buy their "more than just MIDI learn statement" better. Yep, thats basically the gist of it. 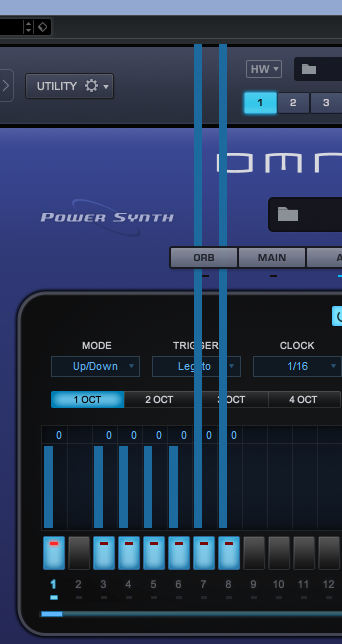 I think there's an Omnisphere 2.5 Controller thread here on the Instruments forum where someone's made some templates to do just what you're talking about. So "it's more than MIDI Learn" but yes, I believe it's just sending a value that can be faked. In the nicest possible way, it is kinda obvious if you're on the Main tab. On the left hand side - Signal Path. andrew71 wrote: So I've trashed my Cubase 9 settings, which should default all preferences, and rescanned everything. I'm still seeing the same GUI issue - the sound loads and is playable immediately but it takes around 10+ seconds for the GUI to update to show the patch name and parameters. Fine in Cubase 8.5 on the same machine and in the standalone application. ...and the pitch information was ignored too. A restart of the project restored normality. So I think there is something a little odd going on with this version, and it seems to be a bit unpredictable. Sadly can't think what else to suggest in your case, except to contact support. I think the only way really is to look up the midi implementation tables for the synths. Every one I looked for was fairly easily available after a quick google search. Since Omni is receiving and not transmitting those messages and you don't have the original controller, sadly there's no easy short cut. I found sometimes the actual value of the parameter when it came to fixed position switches such as waveform selection was a bit of trial and error, but all the midi CC / NRPN numbers themselves have been correct. Sometimes there are controls that Omni doesn't utilise AFAIK, such as sequencer buttons, hardware setup menus etc. As to the beyond-midi-learn wizadry, its very real and all inside Omni itself. So yes, the good news is that if mapped 1:1, any controller will behave in the exact same way as the original hardware. wagtunes wrote: Okay, just downloaded the 3 files required for update. Does it matter which one I run first? In Windows you just run the exe and that's it. Thanks for checking. I'll give my laptop a test at the weekend. I'm also sitting on an upgrade to 9.5, hoping to delay activating it long enough so that I can take advantage of a potential grace period for Cubase 10 updates. Maybe I'll just bite the bullet and activate it at the weekend.